Paper. Online Appendix. Coverage by VoxDev, World Bank. How large are the benefits to improving transit in cities, and how are the gains shared between low- and high-skilled workers? This paper uses detailed tract-level data to analyze the construction of the world's largest Bus Rapid Transit (BRT) system–TransMilenio–in Bogotá, Colombia. First, I build a quantitative general equilibrium model of a city where low- and high-skill workers sort over where to live, where to work, and whether or not to own a car. Second, I develop a new reduced form methodology derived from general equilibrium theory to evaluate the effects of transit infrastructure based on “commuter market access”, and use it to empirically assess TransMilenio's impact on city structure. Third, I structurally estimate the model and quantify the effects of the system. I find that while the system caused increases in welfare and output larger than its cost, the gains accrued slightly more to high-skilled workers. The incidence of public transit across skill-groups is determined not only by who uses it most, but also by how easily individuals substitute between commutes, whether the system connects workers with employment opportunities, and equilibrium adjustment of housing and labor markets. Finally, adjusting zoning regulations to allow increased building densities in affected locations would have led to higher welfare gains. This underscores the benefits to cities from pursuing a unified transit and land use policy. Developing country cities are characterized by informal housing–slums–but growing urban populations and incomes will lead governments to pursue a host of policies that promote the construction of modern, formal sector housing. This has the potential to affect entire neighborhoods since the effects are likely to spillover beyond directly targeted locations. In this paper, we ask how large are the spillovers from formal development, and what do these imply for the welfare consequences of pro-formalization policies in developing country cities? We address this question in three steps. First, we exploit a unique natural experiment in Mumbai that led 15% of central city land occupied by the city’s defunct textile mills to come onto the market for redevelopment in the 2000s. Second, we use a “deep learning” approach to measure slums from satellite images, and combine this with administrative sources to construct a uniquely spatially disaggregated dataset spanning the period. Third, we develop a quantitative general equilibrium model of a city featuring formal and informal housing supply to guide our empirical analysis. We find evidence of substantial housing and agglomeration externalities, and provide reduced-form evidence suggestive of both efficiency gains (through increased employment density in central areas) and potential equity losses (through the conversion of slums and gentrification near redeveloped mill sites). with Marianne Bertrand and Chang-Tai Hsieh. Paper. Coverage by Chicago Booth Review. Many observers have pointed to the bargaining power of organized labor, as initially implemented by the Industrial Disputes Act (IDA) of 1947, as an important constraint on growth in India. This act raises the cost of labor and of laying off workers, particularly for large firms with more than 100 workers. Since the late 1990s, large Indian manufacturing firms have increasingly relied on contract workers supplied by staffing companies who are not subject to the IDA. By 2011, contract workers accounted for 36% of total employment of firms with more than 100 workers. At the same time, the thickness of the right tail of the firm size distribution in formal Indian manufacturing plants has increased, the average product of labor for large firms has declined, the volatility of growth rates among large firms has increased, and the probability that large firms introduce new products has risen. We provide evidence in support of the causal effect of the increased supply of contract labor on the relaxation of employment constraints among large establishments following an Indian Supreme Court decision in 2001. We develop a model of firm growth subject to firing costs to quantify the effect of contract labor on TFP growth in Indian manufacturing. with Leo Iacovone and William F. Maloney. Paper. This paper offers new evidence on the incidence, cause and effect of the family management of firms. We argue that its prevalence, particularly in lower income countries, is reflective of a weak contracting environment and is an important determinant of aggregate productivity differences. To do so, we first create a unique new firm level database across 134 regions in 11 European countries that enables us to establish a set of novel stylized facts concerning the sorting of firms across management modes according to firm and regional characteristics. Second, we develop a simple model of industry equilibrium in the spirit of Melitz (2003) in which heterogeneous firms decide between family and professional management when the latter are subject to contracting frictions. Third, we show that consistent with the predictions of the model, the data features sorting of firms across management modes in which smaller firms and those in regions with worse contracting environments are more likely to be family managed. Importantly, we show these patterns have implications for aggregate performance: family managed firms are on average 24% less productive than professionally managed firms and moving from the least reliable contracting environment region/country to the maximum increases TFP by 14.68%/21.5% respectively. Finally, our results suggest that it is more family management than ownership that drives these results. Where do migrants choose to live and work in cities, how do they adjust and integrate into new communities, and what does an influx imply for city structure and the welfare of inhabitants? We answer these questions in Amman, Jordan, a city where 16% of current inhabitants are refugees from the Syrian crisis. We combine administrative data available before and after the height of the crisis with call data records (CDR) and proceed in three stages. First, we merge the CDR with an external survey and use machine learning to classify migrants and non-migrants in the data. 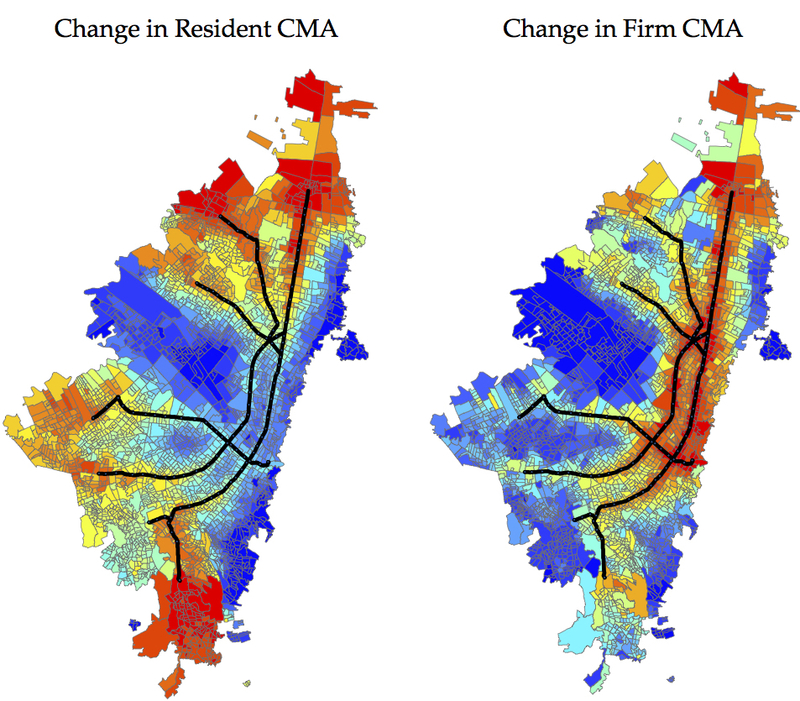 We establish new stylized facts over the dynamics of migrants’ locations of residence and employment, and how their networks integrate into neighborhoods. Second, we use the administrative data to empirically assess the characteristics of neighborhoods migrants were drawn to, and the effect of migrant influxes on neighborhoods themselves, using a neighborhood’s initial composition by nationality and the city’s geography to instrument for the migrant influx in a particular location. Finally, we develop a dynamic model of a city featuring two types of workers (migrants and non-migrants), and estimate its parameters using the variation provided by the Syrian crisis. The model allows us to evaluate the impact of various counterfactual policies, such as temporary housing, on the evolution of city structure and welfare.